I know we are settled in Bangkok when we now have our favorite restaurants to dine. Yes, it took us longer to find our favorites. To begin with we were absolutely clueless and the language difference posed to be a bigger challenge. Unlike Manila and Cebu, restaurant recommendations would be from friends through word of mouth and from the reputable food bloggers. A big thanks to social media, we are slowly threading our way to the best restaurants in Bangkok. We pass by this restaurant every week on our way to church. And then I read this article on CNNGo. 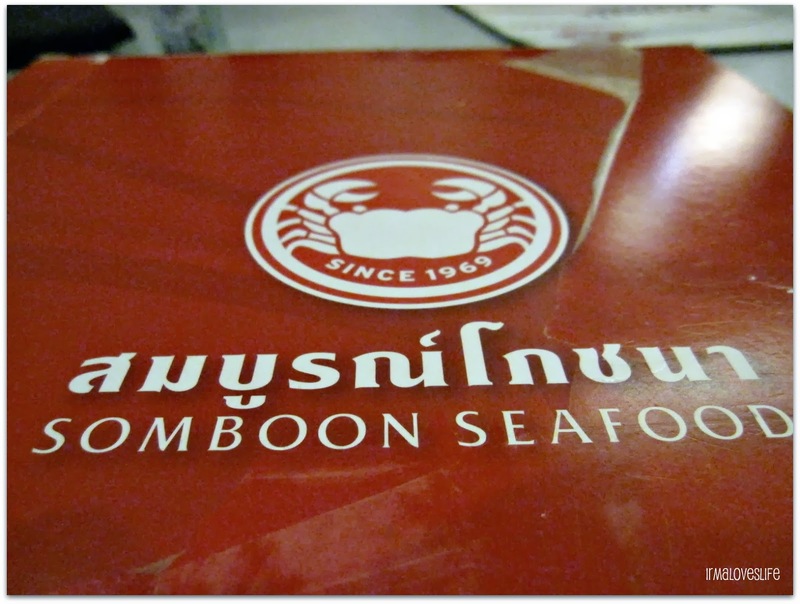 At Somboon Seafood on Surawong Road, you’ll find a plate of their famous crab curry on every table in the joint. 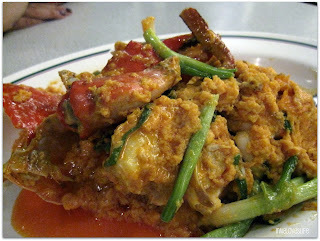 Surrounded by a thick, sweet sauce, the juicy chunks of crab ensure there’s hardly anything for the waitress to clean up. According to legend, one fan from Singapore actually jets up to Bangkok just to get his monthly fix. I love crab. It is probably my most favorite ingredient. My face brightens up and my eyes light up when I see crab being served to me. When my family recently visited us, we decided to bring them to Somboon. True enough, CNNGo was right. The other dishes we ordered were equally good. We only took photos of the curry crab. It's the star of the restaurant. Jed and I will definitely be back. 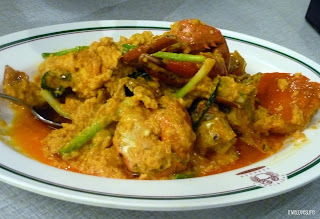 Next time, I will just order the fried curry crab and seamed rice. Yum! One great thing about this is the proximity to where we live. It's right at the beginning of our road. My siblings and I walked after dinner. It took us about 20 minutes. 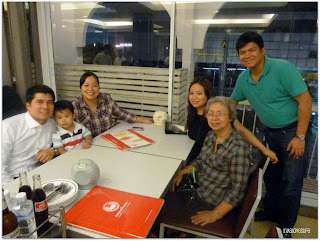 For our fourth wedding anniversary, Jed found a newly-opened restaurant for us to have dinner. It's called L'ulivo Italian Cuisine. He accidentally saw it while walking and was recommended to him by one of the chefs at the hotel. Be still my heart, the restaurant exceeded my expectation. L'ulivo is an Italian word for olive tree. The chef owner Danilo Aiassa is Italian. The restaurant reminds me Lolo Dad's Cafe by Chef Ariel Manuel in the Philippines. They both have a homey feel to their restaurants which are categorized as fine dining. Another similarity is their open kitchen. This next dish was not on the menu. Chef Danilo asked what we wanted for Javi. We asked for spaghetti with meat sauce and he served us this yummy dish. Jed and I couldn't help ourselves. We had more than a few bites. According to their restaurant manager, Carlo, this cod fish dish is one of their best-sellers. And we thought we were full, then Chef Danilo sent over this ravioli dish. It was excellent. This was actually on the house! Chef Danilo asked us what dessert we wanted and we left it up to him. This pie was pretty special. I think Javi was the only kid in the restaurant. And boy our two year old has all the energy in the world. 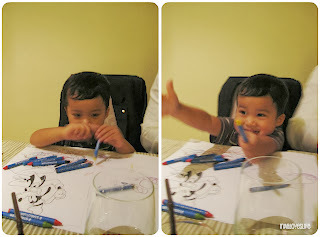 In order to keep him busy, the restaurant provided him with crayons and some coloring pages. He truly enjoyed his time at L'ulivo. Maybe a little too much. Jed gave me flowers. He hates giving flowers. But he loves me and I love flowers. What a great way to celebrate our fourth anniversary. New Italian restaurant. Excellent dining experience. Service was impeccable. The chef, restaurant manager and staff were all very accommodating. And the best part is we only have to cross the footbridge to get to the restaurant. We can actually see L'ulivo from our balcony. I told Jed I wanted to go back to L'ulivo for his birthday.